It is most known due to its use in traditional medicine. However, there is currently insufficient evidence to determine if goldenseal has a justifiably good therapeutic index for any conditions. Research into the efficacy of goldenseal for a variety of uses is ongoing. In herbalism, goldenseal's roots and rhizomes have been historically harvested and claimed to be a safe and effective multi-purpose remedy. Currently, some herbalists who support the use of goldenseal claim the herb's efficacy is due to high concentrations of berberine and hydrastine. The herb is believed to possess some measure of anti-inflammatory, anti-diarrheal, antibacterial, and immune system-enhancing properties. Goldenseal is used to purportedly control muscle spasms, treat cancer, stimulate the heart and increase blood pressure, treat gastrointestinal disorders, treat conjunctivitis, manage painful and heavy menstruation, treat infections topically, reduce swelling and alleviate edema. Goldenseal may be purchased in salve, tablet, tincture form or as a bulk powder. It is often used to boost the medicinal effects of other herbs with which it is blended or formulated. According to the American Cancer Society, "evidence does not support claims that goldenseal is effective in treating cancer or other diseases. Goldenseal can have toxic side effects, and high doses can cause death." Even though not enough research has been completed to determine the plant's efficacy, some experiments have shown that goldenseal is effective at reducing infection[which?] and potentially useful in the prevention and treatment of MRSA (Methicillin-Resistant Staphylococcus Aureus). Although the 2012 article, "Quorum Quenching and Antimicrobial Activity of Goldenseal (Hydrastis canadensis) against Methicillin-Resistant Staphylococcus aureus (MRSA)", found evidence of efficacy ("a demonstrated quorum-quenching activity against several clinically-relevant MRSA isolates (USA300 strains)") it did not evaluate the toxicity of goldenseal or consider the therapeutic index. Herbalist Paul Bergner investigated the research and has been unable to find case reports in which levels of intestinal pathogens were lowered after taking goldenseal. A study in which men with E. coli-induced diarrhea had 42–48% reduced symptoms after taking berberine showed unchanged levels of intestinal bacteria, pathogenic or otherwise, after taking goldenseal. Dr. John Henry Pinkard, a noted "Yarb Doctor" and producer of medicines in Roanoke, Virginia, during the 1920s and 1930s, had a variety of remedies that he prepared and sold out of his drugstore and shipped across the country. Some of the names were: "Pinkard's Hydrastic Compound" (evidently made from goldenseal or Hydrastis canadensis), "Pinkard's Great Liniment" and "Pinkard's Sanguinaria Compound" (made with Sanguinaria). Many of his potions were based on herb lore taken from traditional slave and rural Virginia medical practices and local tribal remedies. A study in which pregnant rats were fed about 47 times the usual human dose of 26 mg/kg concluded, "Maternal liver weights were increased at ≥6250 ppm, suggesting possible enzyme induction. There was no definitive evidence of developmental toxicity in this study." Another study, in which mice were fed about 300 times the estimated human intake from dietary supplements, concluded, "Maternal liver weights were increased at greater than 12,500 ppm, but in the absence of treatment-related histopathological lesions. At the high dose, definitive evidence of developmental toxicity was limited to a statistically significant (~8%) reduction in average fetal body weight per litter." The lethal dose (LD50) of berberine for humans is thought to be 27.5 mg/kg. Berberine is absorbed slowly orally; it achieves peak concentrations in four hours and takes eight hours to clear Berberine is excreted in the urine and human studies show evidence that it can be absorbed through the skin. Pharmacokinetic data is not available for hydrastine or goldenseal root powder. Berberine in humans can cause blocking of receptors in smooth muscle, blocking potassium channels in the heart and reducing ventricular tachycardia, inhibiting intestinal ion secretion and toxin formation in the gut and increasing bile secretion. Side effects of goldenseal may include "digestive complaints, nervousness, depression, constipation, rapid heartbeat, diarrhea, stomach cramps and pain, mouth ulcers, nausea, seizures, vomiting, and central nervous system depression. High doses may cause breathing problems, paralysis, and even death. Long-term use may lead to vitamin B deficiency, hallucinations, and delirium." In addition, goldenseal may cause brain damage to newborn babies if given directly or if taken by breastfeeding or pregnant mothers, and may affect blood pressure unpredictably because it contains several compounds that have opposite effects on blood pressure. Goldenseal became a part of American folklore associated with chemical-testing errors as a result of pharmacist John Uri Lloyd's 1900 novel Stringtown on the Pike. In the book, the victim's habit of taking goldenseal in the form of digestive bitters causes the herb to appear as the poison strychnine in a chemical test, thus suggesting murder. Canada, as well as 17 of the 27 U.S. states where goldenseal grows natively, have declared it as threatened, vulnerable or uncommon. 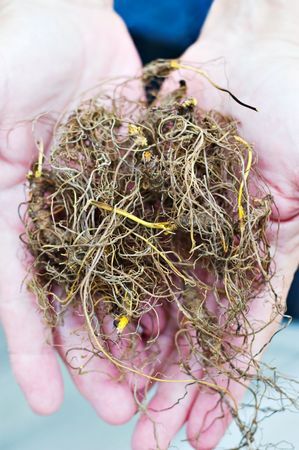 More than 60 million goldenseal plants are picked each year without being replaced. Although goldenseal's geographical range is wide, it is found in small quantities in these habitats. The core of the herb's range is in the Ohio River Valley, but its population there has decreased by almost half. The process of mountain top removal mining has recently put the wild goldenseal population at major risk from loss of habitat. Goldenseal may be commercially cultivated through agroforestry in natural settings mirroring the plant's ecological environment, or on farms with artificial shade canopies. Another propagation method of goldenseal utilizes a controlled environment such as a greenhouse growing lab where the plant's environmental needs such as light, water and temperature are artificially simulated. Crop selection and biotechnology experimentation may be employed to increase yield and pharmacological potency. Controlled environments can greatly reduce the amount of time required to grow goldenseal to its desired harvestable state. While forest-cultivated plants double in mass every three to fiveyears, plants can double in mass every 15 weeks in growth chambers and triple in growth when in a course soil medium. Subculturing can take place every 30 days to mass-propagate the plant.